MouthWatchers Antimicrobial Toothbrushes were founded by Dr. Ronald Plotka, a renowned Boston dentist. His 40 year passion for the best oral care possible led him on a quest for a toothbrush that would truly benefit patients health. He made a combination of unique antimicrobial* and dual layered flossing bristles™ provide the patient with THE optimal brushing experience. The number one compliment they receive from their customers is that "it feels like I just had a professional dental cleaning". This is high praise for a toothbrush. What are the benefits of having an antimicrobial flossing toothbrush? Mouth Watchers is proud to announce that they have been included as the only toothbrush in the "Best Products Evaluated During 2012" by the Clinicians Report (the Consumer Reports for dentists), founded by world famous dentist Dr. Gordon Christensen! 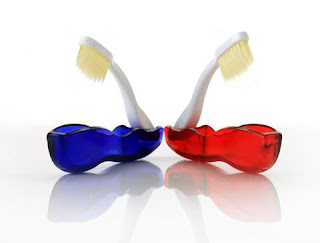 MouthWatchers has many options to choose from for you to get your toothbrush needs. You can purchase one toothbrush or you can purchase them in packs or by subscription. A manual toothbrush pack of 4 is $17.99. A family pack of 6 is $25.99. A family pack of 16 is $59.99. A family fun pack contains the following: 6 manual, 2 power toothbrushes and 3 replacement heads. The total for this pack is $79.99. A yearly supply of the Adult Manual Toothbrush, shipped to you every three months is $20.99. A travel pack of two toothbrushes is $9.99. Finally, the MouthWatchers Antimicrobial Floss Bristle Silver Toothbrush Pack, Adult 20 pack is $75.00. As you can see, MouthWatchers has a great selection of toothbrushes to fit your needs. I used the MouthWatchers Adult Microbial Toothbrush. They come is soft, as recommended by the American Dental Association. I found the toothbrush to be very nice. It is easy to brush your teeth with this toothbrush. The adult toothbrush is large, I am used to an electric toothbrush, which is much smaller. I liked that the bristles were able to get around all of my teeth and it felt as if my teeth were very clean after I used the toothbrush. It did even feel as if I had flossed my teeth. I am very happy with this brush and will continue to use it. I think I will still continue to use my electric toothbrush once in a while too. The one thing I noticed that was a little unusual is that I have sensitive gums from wearing a device for a long length of time and they are very sensitive to brushing. I did notice that when I used the MouthWatchers toothbrush my gums bled a bit more than with my electric toothbrush. I think this is due to me using the toothbrush a little bit harder on my teeth than I would with the electric toothbrush which just does the work for me. MouthWatchers Antimicrobial Toothbrushes are available from www.mouthwatchers.com. Like MouthWachers on Facebook: https://www.facebook.com/MouthWatchers; Follow MouthWatchers on Twitter:@mouth_watchers and Follow MouthWatchers on Tumblr: http://blog.mouthwatchers.com/.